Considering the frequency with which I make soup, it is actually a little surprising that I'd never made a pea soup before. I freely admit that I LOVE the canned sludge that is Habitant french-canadian pea soup. This is one of those foods that's kinda love or hate, but there's no denying that it essentially defined nearly a century of québécois cuisine(not the habitant brand, but pea soup in general). Hémon immortalized it best in Maria Chapdelaine, but it was the daily fare for many a farmer in la belle province. It wasn't really a delicacy though - it was easily and cheaply made, from ingredients that would keep for a long time. In fact, in some of the poorer families, it would likely be once of the ONLY meals they would eat all winter. And when your growing season is very, very brief, you need that kind of food. It's quite nutritious too - fibre, protein, etc. Since I don't have to eat it day in and day out...well, I quite like it. Hubs, on the other hand, perhaps owing to some deep-seeded psychological holdback from his french-canadian ancestry, claims to HATE pea soup. Like completely and utterly hate it. So I'd never made it before. hubs: you have totally won me over to pea soup. this is freaking phenomenal. me: can i quote you on that? So there he is, quoted. A testimonial from an avowed hater of pea soup. This soup takes a while to come together, but the actual labour involved is pretty minimal - it's great for a weekend or, if you're on mat leave (like me). Highly recommend this. 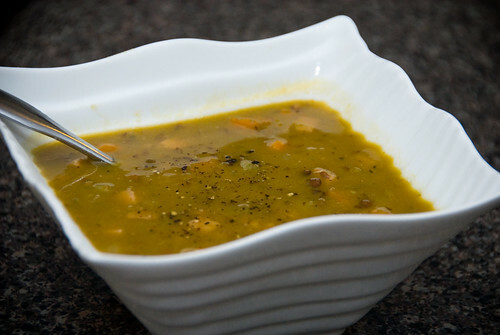 Even if you think you hate pea soup. 1. In a large pot, heat the olive oil over medium heat. 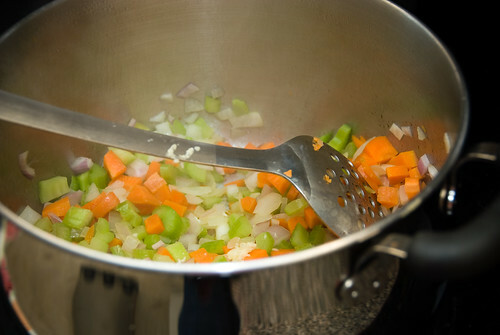 Add the onion, celery, carrots and garlic. Sauté for about 5 minutes. Add the thyme and oregano and cook 1 more minute. 2. Meanwhile, rinse the peas and lentils. I just rinsed them together. 3. 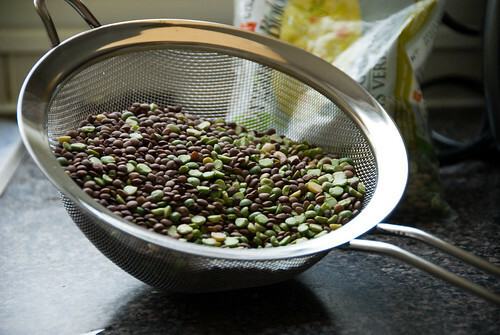 Add the lentils and peas to the pot, toss to coat in the oil/veggie mix. 4. Add the chicken broth, bay leaves, and the rind of the ham (just cut it off in big pieces - this will help flavour your broth). 5. Bring to a boil, then let simmer for about an hour. Then, remove the ham rind, as well as the 2 bay leaves. 6. Ladle half of the soup into a blender. Before you turn on the blender, loosen the cap a tiny little bit (so the steam won't build pressure) and then cover it loosely with a tea towel (to contain splatters). You may also want to use an oven mitt on the hand that holds the tea towel on (hot soup is bad news). 7. Blend until smooth. Return to the pot with the remaining UNBLENDED soup - this gives it a nice thick texture, while still retaining the structure of some of the lentils/peas and veggies. Stir in the ham cubes and let simmer for another 10-15 minutes (or longer). Season to taste. This is a great dinner for a chilly day - it's simple, it's healthy and, as you can see above, will make you a hero to a pea-soup-hating hubby. Oh that looks great! I have to agree with your husband I'm not a fan of pea soup. However since he liked it I guess I better reevaluate my decision and make the soup! Thanks! I make this at least once a month, sometimes two or three times. I most often use rosemary, but I like to switch it up every now and then. Once in a while I get some gristle from th hock...but the flavor from the hock makes it worth any gristle I might find. I *heart* pea soup. This one is getting made in my kitchen. And soon. We have leftover Habitant in the fridge. My hubby enjoys it as well.